TACOMA, Wash. (AP) — An Amtrak train making the first-ever run along a new route hurtled off an overpass Monday near Tacoma and spilled some of its cars onto the highway below, killing an undisclosed number of people, authorities said. 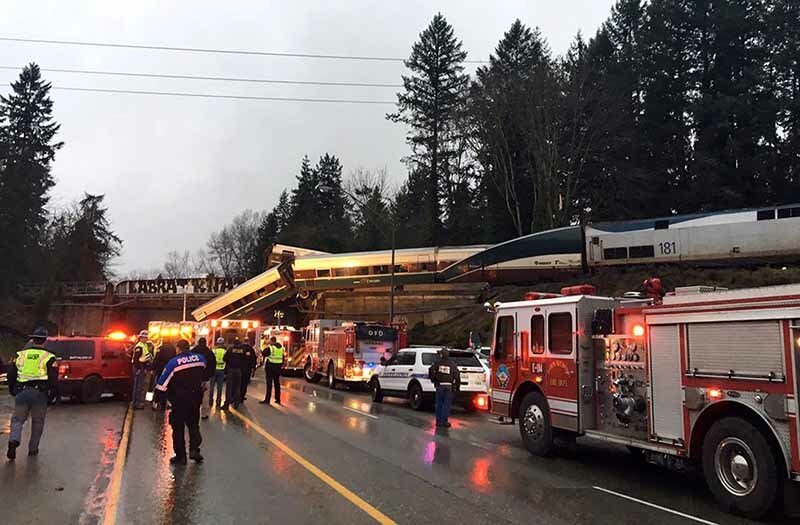 Seventy-eight passengers and five crew members were aboard when the train derailed about 40 miles (64 kilometers) south of Seattle before 8 a.m., Amtrak said. Ed Troyer, a spokesman with the Pierce County Sheriff’s office, said multiple people were killed aboard the southbound train, but no numbers were immediately available. The sheriff’s office said several vehicles on Interstate 5 were struck by falling train cars and multiple motorists were injured. No fatalities of motorists were reported. The maximum speed along the stretch of track, known as Point Defiance Bypass, is 79 mph, according to information about the project posted online by the Washington State Department of Transportation. Associated Press writers Sally Ho and Phuong Le in Seattle and Michael Sisak in Philadelphia contributed to this report.